The campaign office of Barr. Tab Ogara, factional guber candidate of the All Progressives Congress, APC, in Enugu State, was on Sunday morning gutted by fire. The fire, which burnt down two branded vehicles, were said to have emanated from an explosion. NIYI DARAM reports that it took the quick intervention and efficient services rendered by officials of the Enugu State fire service to prevent the fire from wrecking further damage. Ogara is the governorship candidate produced by Deacon Okey Ogbodo faction of Enugu APC. His campaign office is located very close to that of Senator Ayogu Eze at Chime Lane, beside Ogui junction. 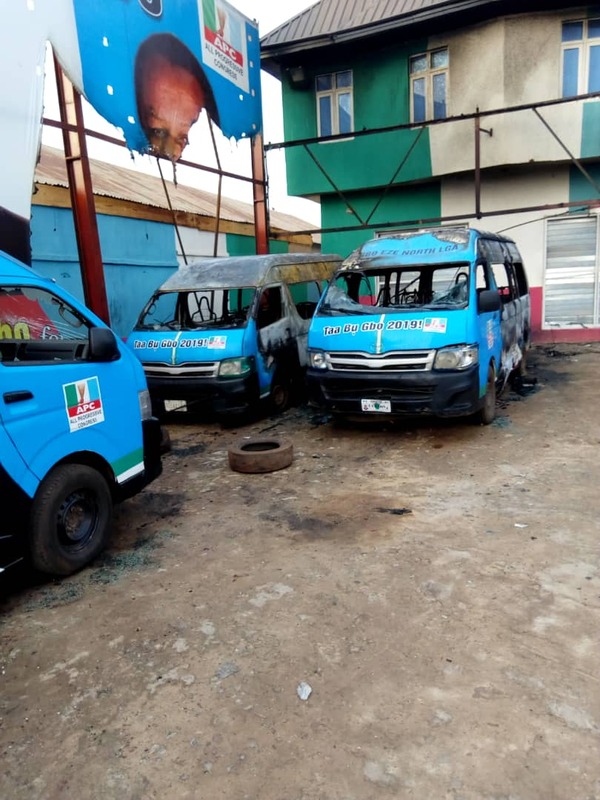 The windsreens of three other buses were smashed, creating a suspicion that the fire was deliberately set up by yet to be identified hoodlums or thugs. The Enugu state Chief Fire officer, Engr Okwudili Ohaa in a telephone chat confirmed that the incident occurred around 2 a.m. on Sunday. He said he learnt it started with what sounded as an explosion in the two vehicles, simultaneously. “Because of the proximity to our office, my men were right there on time with two fire engine and fought gallantly to quench it,” he added. The Enugu State Police image maker, Mr Ebere Amariazu (SP) also comfirmed the incident, stating that the police had already commenced detailed investigation.